Carrying on from the previous thread. I'll start this off with us waiting for, Bali’s Mt Agung to blow. Over the last few weeks there have also been quite a few shakes'n'quakes happening along the section of the ring from Bali to New Zealand. Message 1896016 - Posted: 18 Oct 2017, 21:03:31 UTC - in response to Message 1892545. Do you live on the Ring of Fire? As for the earthquakes in Italy we know something about it. Message 1898492 - Posted: 1 Nov 2017, 8:54:10 UTC - in response to Message 1898391. I just looked on the USGS site - lots of rumbling around New Caledonia in the last couple of days. Message 1898577 - Posted: 1 Nov 2017, 20:12:31 UTC - in response to Message 1898489. Thankfully I don't, but it does run around east and north of our little island here and it has been quite active of late. So part of Zealandia has shaken, well hopefully no one got hurt or died cause of this. Zealandia's is a 5.0 Not much of a shaker. There was another 5 just north of there since your post. I don't envy the people living on the Ring of the Fire. They live with the fearness and axiety. Message 1899020 - Posted: 4 Nov 2017, 3:02:55 UTC - in response to Message 1898836. We don't. Anything less than a mag 5 is a non-event. 6 and 7's will get us talking but they are so rare. In my lifetime I have lived thought about 6 events over a mag 6. Yes I have had to do some clean up, but generally we don't think about them. I've built houses with 50 feet of the San Andres and working on a high speed train that will go right over it. Sure we design with quakes in mind but we don't fear them. 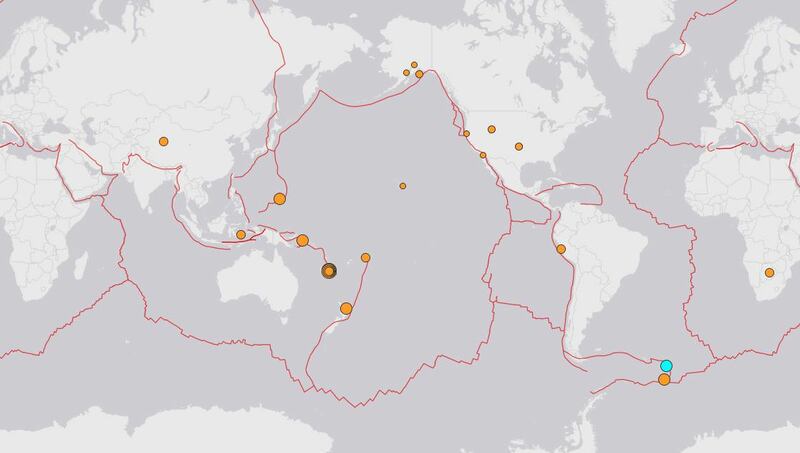 A powerful magnitude 7 undersea earthquake struck east of New Caledonia's Loyalty Islands in the South Pacific on Monday, sending small tsunamis towards New Caledonia and neighbouring Vanuatu, where authorities ordered evacuations. we have plenty close here but almost all are small 2.0 to 3.5 normally. we have a term. electric plant just 13 miles from here and we get about 4 or 5 a day at times. but no damage to speak of here. I agree 6 to 7 you take notice. Well Bali’s Mt Agung has erupted twice now in the last week stranding tourists. I know your a long ways but have you had anything from that? We're not feeling a thing here Grant, but N.Z., Fiji, Tonga, East Timor and Indonesia are all being shaken by >4 magnitude quakes in this part of the world around us. Ring of Fire looks pretty quite today. 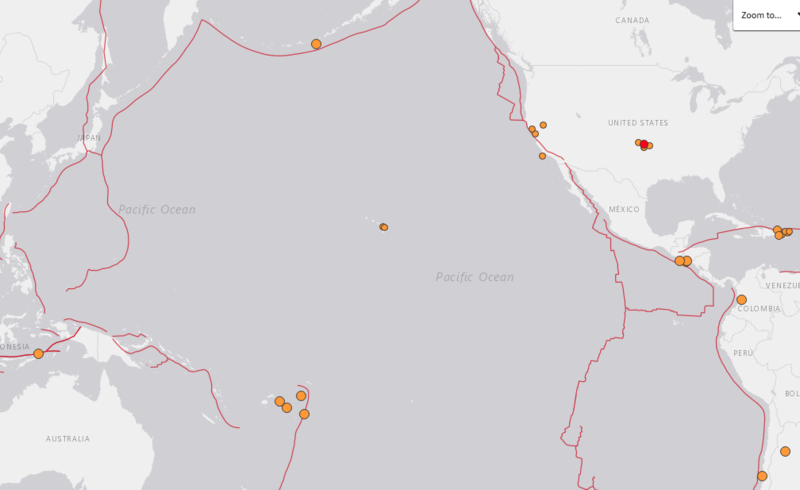 Except for the 4+ quakes around Tonga and a few in central America. A good explanation of the pictures coming from Mount Agung: Bali at the moment.